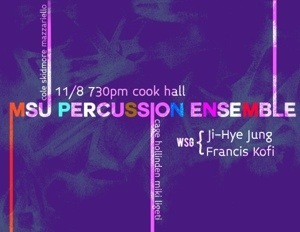 Come one, come all to a concert of percussion ensemble works by Cage, Lucas, Ligeti,Elliot Cole, Andrea Mazzariello, and then some. The concert is in Cook Hall at Michigan State University. This will prove to be a entertaining evening of great music, and it’s FREE!